the costs billed by a Western European repair workshop for that work would bring a desaster to the customer's limited finances, provided the Western European workshop would at all be able to do the proposed work. 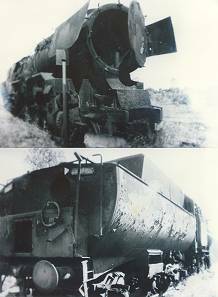 As an example, INTERLOK workers found the Polish steam locomotive Ty 43-127 deposed in a state of complete devastation. For the German customers, this locomotive was especially interesting because it had been put into service as a German BR 42-1504 before Poland took the locomotive over. Among the large range of restoration works, there were the almost complete renewal of frame and steam boiler, the fabrication of one new steam cylinder in welded construction, the assembly of additional water hose connections, and others.The locomotive may be inspected at the Technikmuseum Sinsheim in Speyer/Germany. 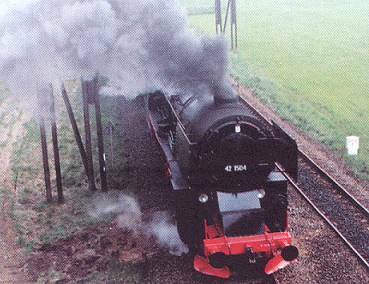 The reconstruction of steam locomotive 50 3610 for steam association EBM Gummersbach /Germany also had a large extent. The former locomotive of Deutsche Reichsbahn had been equipped with a post-war "Reko style" boiler and was used as a stationary boiler before it came to Pila repair works. Therefore, putting the locomotive again into service needed a completion of many missing parts and was a hard work for the workshop. The historical and technical supervision and approval of the works for 50 3610 was realized by the approved steam expert Dipl.-Ing. Rudolf LANGELOTH from Darmstadt/Germany, also in the following cases. 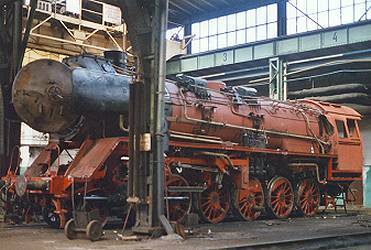 The railway museum at Darmstadt/Germany had received a steam locomotive from a TURKISH twin town - the original Prussian G8 class No. 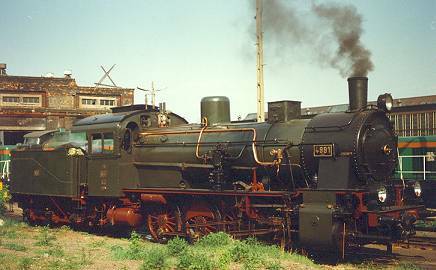 4981 "Mainz" - built in 1913. A close check in the PILA works proved that the locomotive must have had a hard life in Turkey. Apparently, during overhauls, unacceptable changes had been taken place. The locomotive had two different valves - one flat valve and one piston valve - so that for a long time, the frame had been exposed to different forces on both sides, and was totally deformed! After a detailed and true reconstruction according to the original state of the manufacturing year, no faults of the past were left. 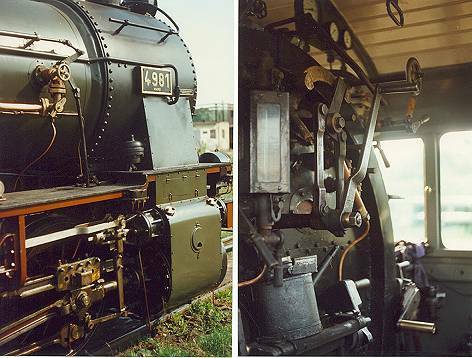 An especially exciting experience was the reconstruction of the unique German Laenderbahn-Locomotive BR18-316, a 4 cylinder compound Pacific that had been dumped as a monument after having been withdrawn from active service for German railway DB. Knowing of the limited financial sources of the customer, INTERLOK was able to bring the locomotive back to the old fame. We especially emphatized the historical correctness of the techniques used for that restoration. Our photographies show boiler and frame. In the back: the wheel sets and the frame of MThBE d3-5 being overhauled for Switzerland.